Today’s venture into history will be a tour of the downtown Hotel Radisson, Minneapolis. Our tour begins with the death of Albert Johnson. Who is Albert Johnson? You see, Albert owned a huge chunk of Minneapolis real estate. It was inherited by Edna Dickerson upon his death. She was convinced by prominent area business people to invest her inheritance (to the tune of $1.5 million) in an upscale hotel venture. Minneapolis’ newest business was born, thanks to Albert. Our next stop is at the infancy of the Hotel Radisson, named after Minnesota’s forgotten explorer Frenchman Pierre Esprit Radisson. Construction began in mid-1908. Steel sheet pilings were used; one of the first buildings in the US to use this construction method. The Radisson’s owners were progressive thinkers for sure. Our third stop of our tour is at the delayed opening of the downtown Radisson, Minneapolis in December, 1909. This newly constructed, 16-story hotel was the second tallest building in Minneapolis’ skyline at the time. The Hotel Radisson, Minneapolis included 425 rooms; most of which had bathrooms. Yes, you read correctly. Rooms without bathrooms cost a $1.50; with one, $2.50 (a far cry from the current $79). This is the end of our tour. I will leave you with some trivia about this hotel gem. A library was off the lobby. 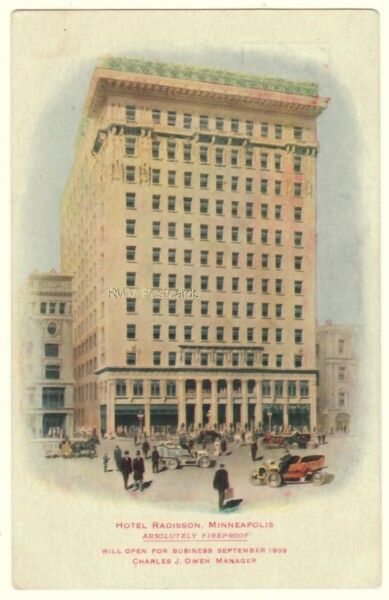 When the Radisson opened, it could not serve alcohol (that came later in 1911). Lastly, 50 female staff and chefs lived in the hotel. Sadly, the downtown Radisson Hotel, Minneapolis closed in late 1981. It was razed in early 1982. I hope you enjoyed your tour. If so, please click on the bookmark button to the right. ** You can find many more wonderful postcards with great graphics in my store, Remember When Vintage Postcards.